In our last update, we deconstructed Truth Seekers and discovered that it was a deck built around a number of comes-into-play intercations with a healthy dose of lifegain to buy time for setting up the pieces. To see how it works in actual practice, I’ve enlisted Sam. It will be something of a ‘mirror match,’ as Sam has selected the G/W Spiritcraft deck (from Betrayers of Kamigawa). Game one opens up with Sam winning the roll and dropping a Forest. Pass. I in turn lay down a Plains, and then one-up her with a Ghost-Lit Redeemer, and thus begins a slow but steady stream of creatures that would last much of the game. I play a Silent-Chant Zubera to match her turn 2 Loam Dweller. On turn 3 a slight pause as she comes in with the Dweller. Not figuring her for any tricks this early, I gang-block with the Zubera and Redeemer, and she flashes a Giant Growth-like Kodama’s Might, sweeping both my valiant defenders to the dustbin of history. Rebuilding comes right away, though, as turn 3 sees me replace my Ghost-Lit Redeemer and add a Shinen of Life’s Roar. (As an aside, had I known the value of the Redeemers to the deck I would never have put him in harm’s path, but that is part of the unique joy of learning a new deck with an interaction I had not caught). My Zubera population doubles on turn 4 as another mighty Silent-Chant Zubera enters play. Given the “special bonus” that happens to these things for each Zubera in the graveyard that entered it this turn, I scratch my head and wonder what the point of the card is. Wrath protection? Sacrifice-effects fodder? It certainly seems to have little role in this deck, at any rate. Nevertheless undaunted, I work the lifegain angle with the Redeemer for two a turn, until turn 6 sees Sam trot out a Kami of the Hunt. Given that most every Instant and Sorcery spell in these decks seem to be subtype Arcane, I vow to keep an eye on him lest he have something of a Kiln Fiend-like effect. My retort to her summons comes in the form of the Briarknit Kami, which will allow me to build up my creature force in much the same way- only permanently. Most everything I play now is making one of my critters even bigger. I begin putting the pressure on in turn 7 as I play the Torii Watchward, and swing with my beaters. Sam’s now at 15, I’m at 24. Sam has the look of desperation as she coughs out another Loam Dweller on turn 8. Smelling blood in the water, I press my assault, using the Redeemer for an extra attacker rather than lifegain. Although I have Rune-Tail, Kitsune Ascendant in my hand, he won’t be the path to victory today as I slowly grind out a win. There’s little glory to be had, however, as Sam has gone all 11 turns of the game without drawing a single Plains. The deck really comes alive for Sam in game two. Having solid land drops for four turns, she’s only able to squeeze out a Petalmane Baku but has threats in hand. Meanwhile I’m working on a Ghost-Lit Redeemer and Gnarled Mass. The Mass bites it almost immediately as Sam pumps the Baku with Kodama’s Might. Attacking in I smelled the trap but thought it a fair trade to pull that card out of her hand before she could start Splicing it to better effect. I replace the Mass with Nikko-Onna, a serviceable 2/2, and Sam drops a Waxmane Baku to start the next turn. My turn 5 play is a Torii Watchward. By the end of the turn, we’re still both at 20 life (I’m actually at 21, thanks to the Redeemer and an early Baku attack). Things heat up turn 6 as Sam aces the attacking Watchward with a Terashi’s Verdict, a sort of modified White Smother. I replace it with the stalwart Briarknit Kami. Next, Sam adds another Waxmane Baku. The first two Bakus are already happily sprouting ki counters, and another doesn’t bode well. 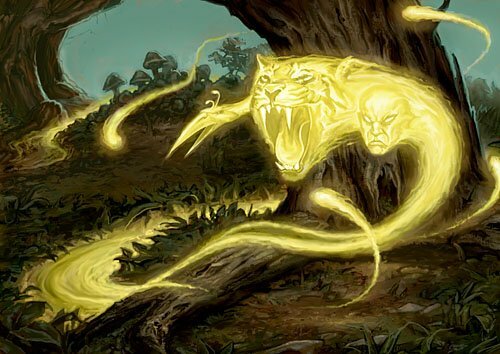 The Petalmane, whose coutners convert to mana, isn’t much of a threat, but the Waxmane’s tap my creatures and can be used to blunt my aggression or even neuter my defense. The next few turns are a flurry of back-and-forth, with little ground gained. A few creatures die going up over the trenches, but Sam is untouchable and meanwhile, thanks to the Redeemer and a well-timed Dosan’s Oldest Chant, I’ve crested 30 life. Although Sam has discovered the ki counters on those Waxmanes and is tying me up in knots by tapping my beaters, turn 11 sees me play Rune-Tail, Kitsune Ascendant and -snap- just like that, my creatures are indestructible. Sam’s quit turtling and is pulling out all the stops with an Oyobi, Who Split the Heavens and the resultant 3/3 Spirit tokens it generates. By turn 12, it’s all I can do to cling on as she’s still at 20 and I’m circling the drain at 6. But the Briarknit Kami keeps pumping up my beaters with every casting, and her ki counters on those damnable Waxmanes can only last so long. Tapping less and less, she’s only able to get me down to 2 (thanks to a game-saving Vital Surge) before I’m able to go all in and finish her off. Sam takes the most aggressive position yet with a first-turn Lantern Kami, a wee 1/1 Flyer, and dropping a second on turn 2. I manage to get out a Moonwing Moth on turn 3 to defend, but she overruns it with Unchecked Growth. By turn 5 it’s already 20-11 in her favour, the Lantern Kami’s promising to make quick work of me if left unanswered. Fortunately, turn 5 sees me lay down the good-as-gold Briarknit Kami, my MVP of the series, and thanks to a string of unbroken land drops I’m able to turn the tables a bit with a turn 6 Nightsoil Kami. I put the Briarknit’s counter on the Nightsoil, which is now 7/5 fresh from the bucket, and next turn swing back at Sam. Adding the damage to the nick she took from an earlier Nikko-Onna, Sam’s holding at 11 while I’m at 7. After the Kami’s bruising hit, I play the Torii Watchward, a card which has underperformed in the previous two games. The next round Sam’s still flying in with the Lanterns, with a Kami of the Hunt and a Traproot Kami wall for defense. I catch a bit of a lucky break with the wall- it’s power and toughness are equal to the number of all Forests in play and we’re both playing Green, but between us we’ve only managed four so the wall is a temporary barrier at best. Marshalling my forces, I Channel a Shonen of Life’s Roar onto Nikko-Onna to pull all blockers to her, which would leave my three beaters (pumped up by Briarknit tokens, as ever) to swing for lethal, but in a clever turn Sam blinks Nikku-Onna with Otherworldly Journey fizzling both my Channel and my plan. Still, she takes 3 from the attack and is reduced to holding back her Lanterns as chumps. She’s dead a turn later. Truth Seekers was a fun deck to play overall, though I still have lingering doubts about its effectiveness, particularly if facing a fast, aggressive deck. It takes awhile to really build itself up, though once it does it offers a solid amount of flexibility along with some solid bodies to get there with. The lifegain can help in the way that all lifegain helps- it buys you extra time and little more. That said, the flip card Rune-Tail’s Essence effect will certainly punish an opponent who’s given you the luxury of too much time and life. In that regard, the deck works. There’s a tremendous number of moving parts here when you take into consideration both the creatures’ abilities and the Splice effects. This is both good and bad, depending on the playstyle of the pilot. If you’re partial tointricate, interrelated abilities and effects then this deck will feel quite comfortable to you. If you’d prefer things to be more straightforward (or hate missing triggers or interactions), you may wish to give it a miss. The block’s core mechanics are well represented here, and playing Truth Seekers will give you a very good idea of what the block’s flavour was. There’s a strong showing for Splice onto Arcane (which I love in part due to its inherent card economy), some Soulshift, a splash of Channel and a flip-card. Add into consideration that the precons in this set are for whatever reason- demand, print run, who knows- exceptionally cheap pickups on eBay, and you’ve got a dependable business-class ticket to visit the land of Kamigawa. Although I was not actively playing when Kamaigawa block was released, such was its ripple effect that even now I am aware that many players found the set somewhat less than enjoyable. Comprised of a number of cards that had either heavy interactions with or even outright reliances upon other cards within the block, it seemed very much a self-contained world that did not integrate well with non-block cards. 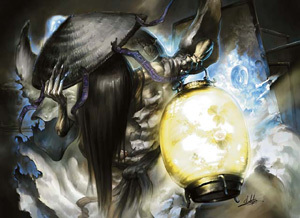 That aside, a player who enjoys strong story and concept will find a rich, Japanese-myhtos-based world as well as a treasure trove of very interesting and unique mechanics within Kamigawa that make for a fun visit through the block’s many preconstructed decks. 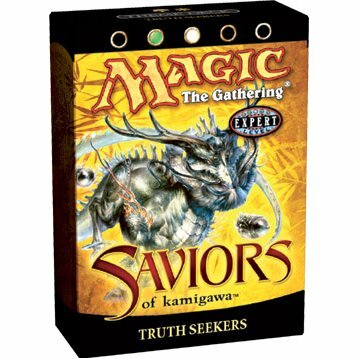 We begin our visit to Kamigawa with a look at Truth Seekers, a Green/White deck from the Saviors of Kamigawa expansion, which concluded the block in June 2004. It is undeniably a creature deck, with only nine non-creature spells on offer. The land count is almost evenly split between the basics, and for added versatility it also throws in a “slow land” in the form of Tranquil Garden. On first blush, the creatures seem a little top-heavy. Ramping is slight, with only the pair of Elder Pine of Jukai fitting the bill, but the composition of the deck is such that once one hits the table you’ll be taking full advantage (32 of the deck’s 36 nonland cards are either subtype ‘Arcane’ or ‘Spirit’). Still, Truth Seekers packs in eight creatures (and two Sorceries) with a converted mana cost (CMC) or 5 or more. This means that it is a statistical certainty that one of these expesive cards will be sitting in your opening grip, more or less giving yourself an effective mulligan into the midgame. The problem for Truth Seekers isn’t so much in the casting, but in the value for mana. Many of the creatures are slightly overpriced for their power/toughness because they have additional abilities that the deck’s engine relies on. Paying 3 for a 2/1 First Strike creature is nobody’s idea of a great deal, and the deck is loaded with such tradeoffs. Only the Gnarled Mass (a vanilla 3/3 for 3), the Ghost-Lit Redeemer, and Dripping-Tongue Zubera come close to cost parity with what you might expect to get out of a creature in the sub-5-CMC range, and the latter one only because it replaces itself. To compound concern, the nine non-creature spells in this deck concern themselves very little with the fate of your beaters. Sure there’s the Giant Growth variant, Kodama’s Might, but that’s it as far as creature support is concerned. The remainder of the cards concern themselves with lifegain or putting 1/1 Spirit tokens into play. Examining its pieces in this way, there’s not a lot to be excited about with Truth Seekers. 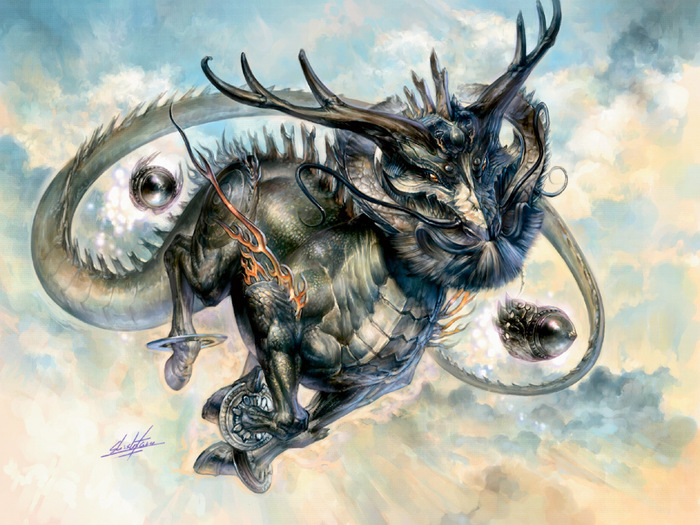 But sometimes you come across a deck that is more than the sum of its pieces, whose interlocking synergy allows the combined deck to punch well above its weight. And on first blush, this may well be one of them. The cards of Truth Seekers have a number of interactions that can summarized as follows: exploit creatures with enter-the-battlefield (ETB) effects by returning them to your hand and casting them multiple times. For this strategy to work, you need to have two resources. First, you need to have creatures with ETB effects (the Elder Pine, Nikko-Onna, Haru-Onna, Briarknit Kami, Bounteous Kirin). 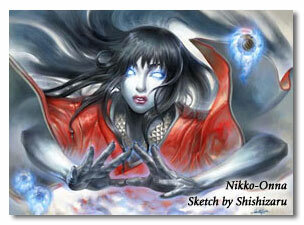 Then, you need to have ways to yank them back into your hand (Nikko-Onna, Haru-Onna, Eiganjo Free-Riders). Note the overlap with the Onnas. As mentioned before, the deck’s creatures at the lower end of the spectrum are somewhat frail, and there’s little in the non-creature range to deal with enemy creatures, so Truth Seekers asks you to put your trust in it to ride out early- and mid-game damage through its lifegain suite of cards. With no effective removal to speak of, it seems a lot to ask. Put another way: by the time all this casting and yanking back and recasting and splicing and other assorted zaniness is done, you’ll either have a decent-sized fatty to start the beats with (Bounteous Kirin, a pumped Briarknit Kami, Nightsoil Kami, Kami of the Honored Dead), or you’ll be amongst the “honored dead” yourself. Now that we see what the Truth Seekers engine is trying to accomplish, the question becomes whether or not it can succeed. At the very least, this unconventional strategy should make for some interesting games. Join us next time when we put Seekers to the test, and see if it can match ambition with accomplishment.